When we host adult parties and get-togethers we like to whip up delicious cocktails for our guests to enjoy. With that said, we also realize the importance of serving mocktails to guests who don't drink alcohol and to our adult guests who will be designated drivers. Today's guest post mocktail recipe is courtesy of Sparkling Ice. 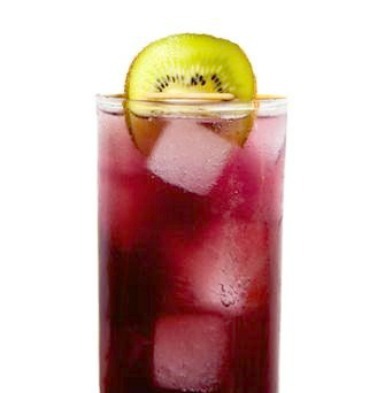 Place the kiwi, brown sugar, and vanilla bean seeds in a glass jar with an airtight lid. Muddle the fruit until fully combined with the sugar. Add the vanilla bean pod. In a small sauce pan bring vinegar to a simmer. Pour vinegar over the kiwi mixture and seal tightly. Shake the mixture a few times and place in refrigerator for 24 hours up to a week, dependent on how strong you'd prefer the flavor. Once ready, strain the fruit mixture using a fine mesh sieve or cheesecloth. Mix equal parts shrub with Sparkling Ice Grape Raspberry and serve over ice. Adjust amount of shrub to your preference. You'll want to serve these mocktails immediately and they're best when served very cold. Enjoy! Looking for additional mocktail and cocktail recipes? You'll find a slew of them over on the Sparkling ICE website and all of them are printer-friendly and super-easy to make!